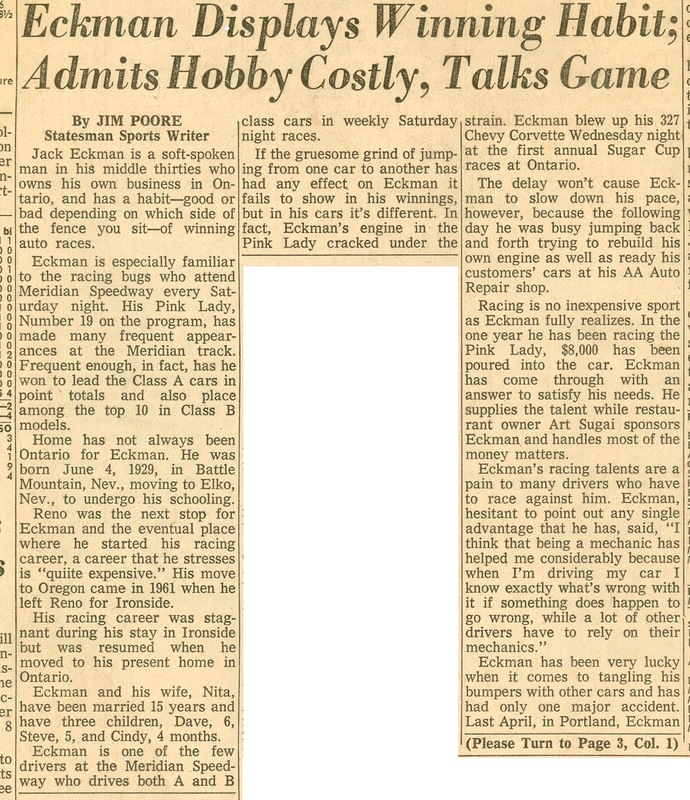 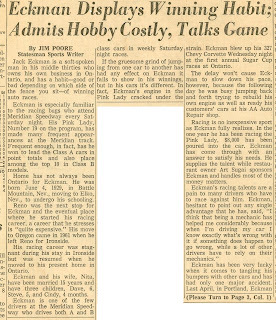 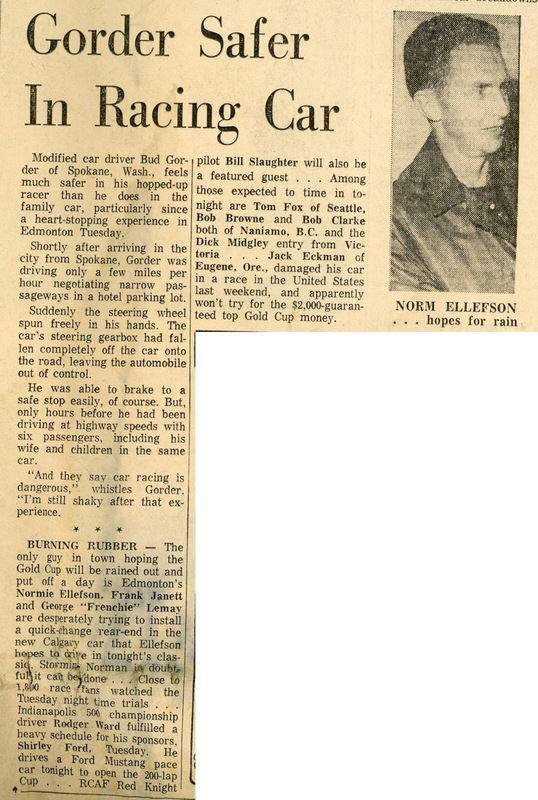 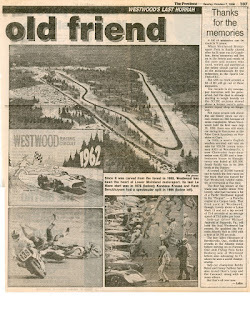 The August 26, 1964 Edmonton Journal continues its good coverage of local racing. 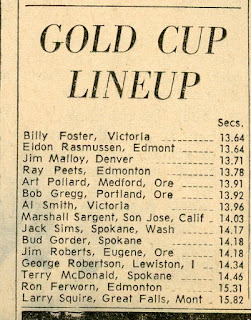 Qualifying for the Gold Cup, 1964. 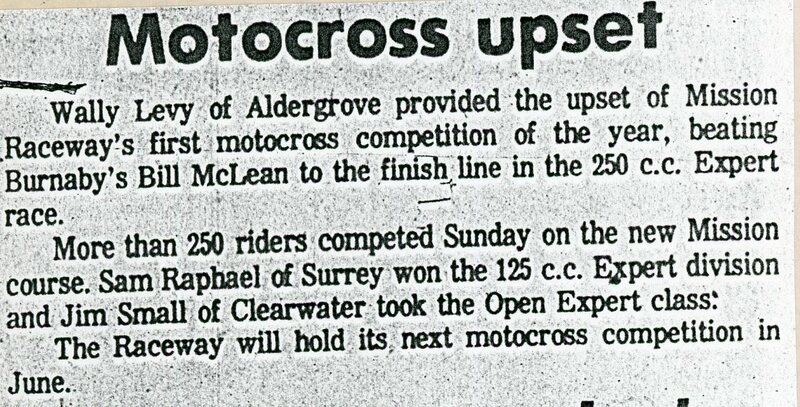 From the August 26, 1964 Edmonton Journal. 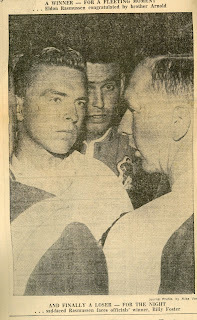 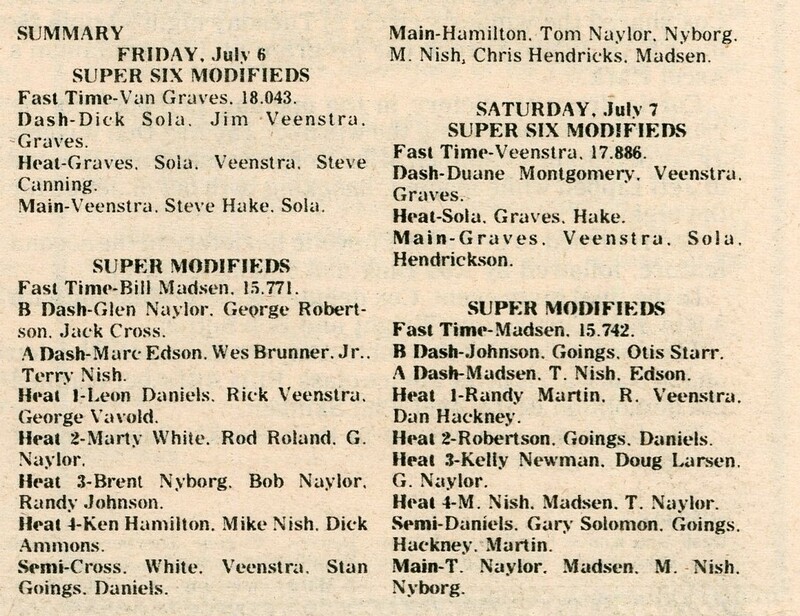 Eldon Rasmussen gets fast time, the time is questioned, then re-times at the same clocking as Billy Foster. 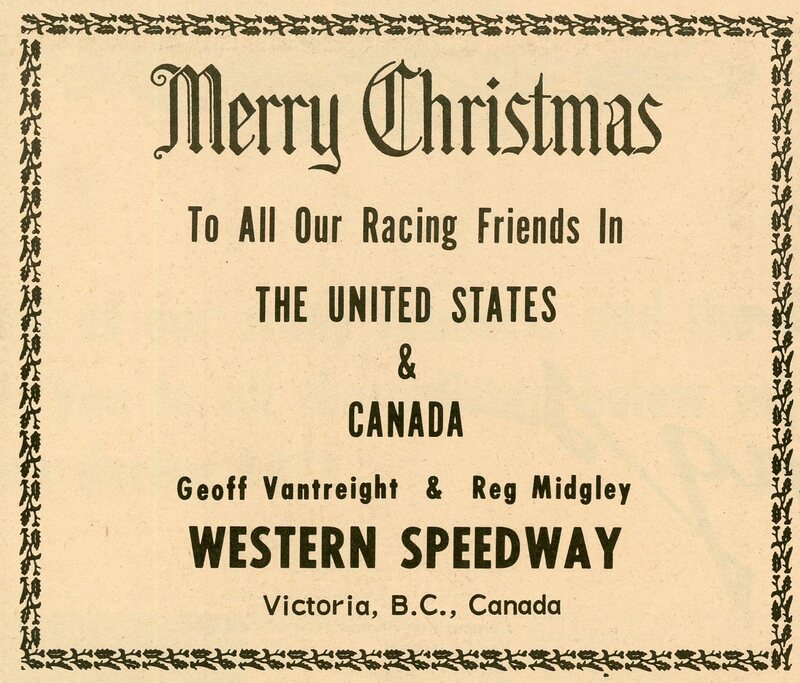 From the November 1964 issue of Canada Track & Traffic. 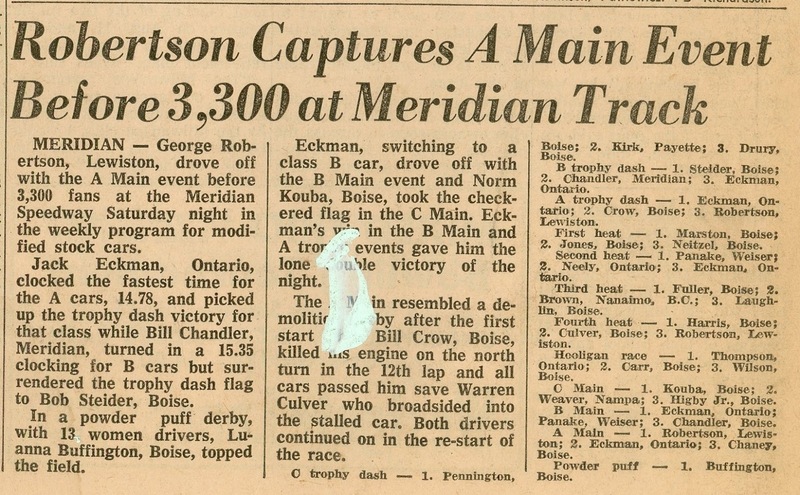 From the August 9, 1964 Idaho Sunday Statesman. 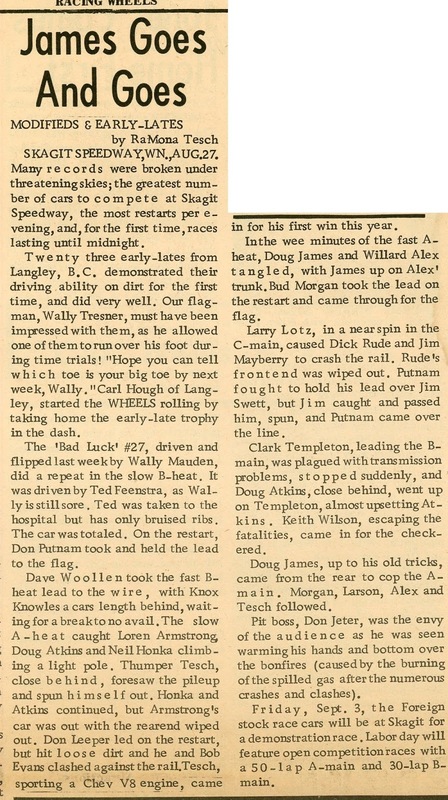 Another item from July 19, 1964. 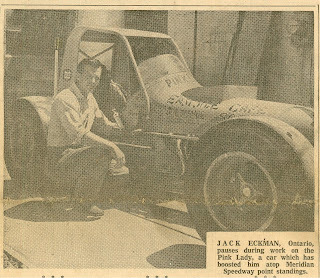 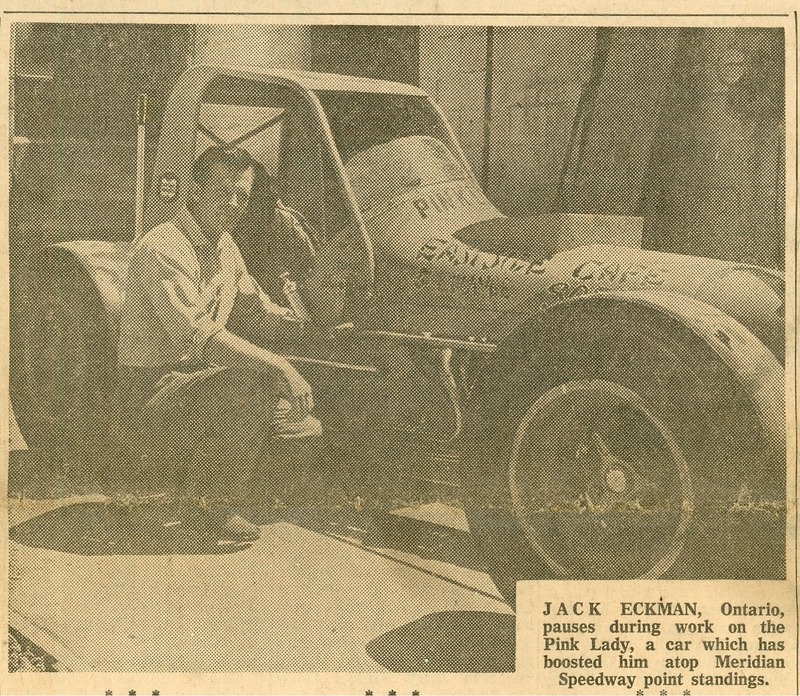 A story on Jack Eckman, July 19, 1964. 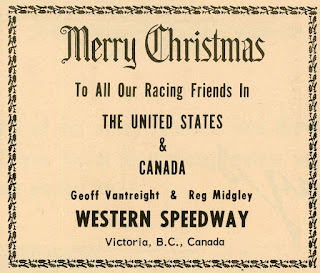 More from King of the Royal Mounted. 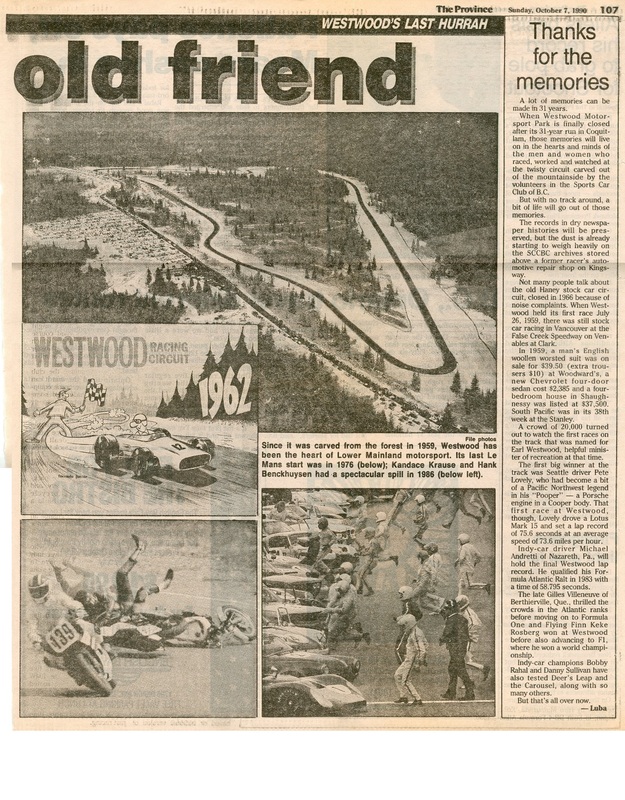 Westwood has a sports car race; Mission has motocross. 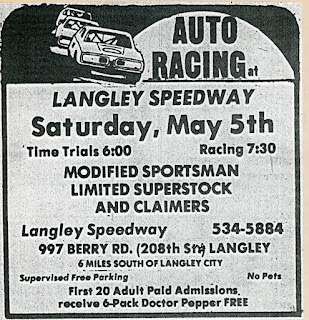 Back to the regular classes of limited super stocks and claimers. 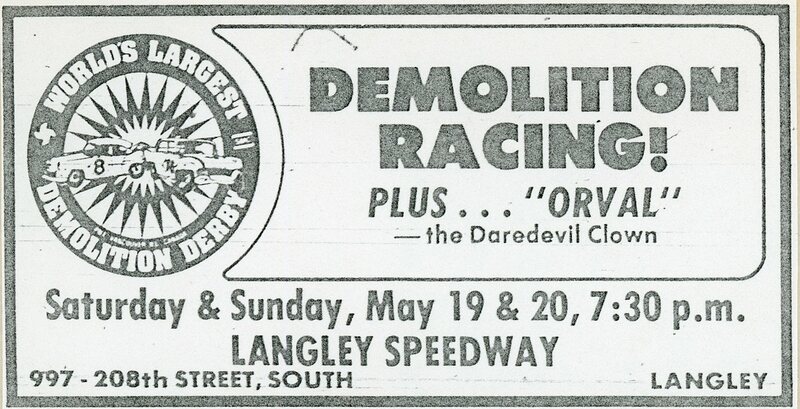 The second day of a double-header demolition race weekend. 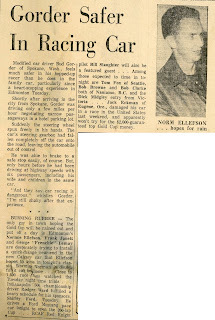 More King of the Royal Mounted. 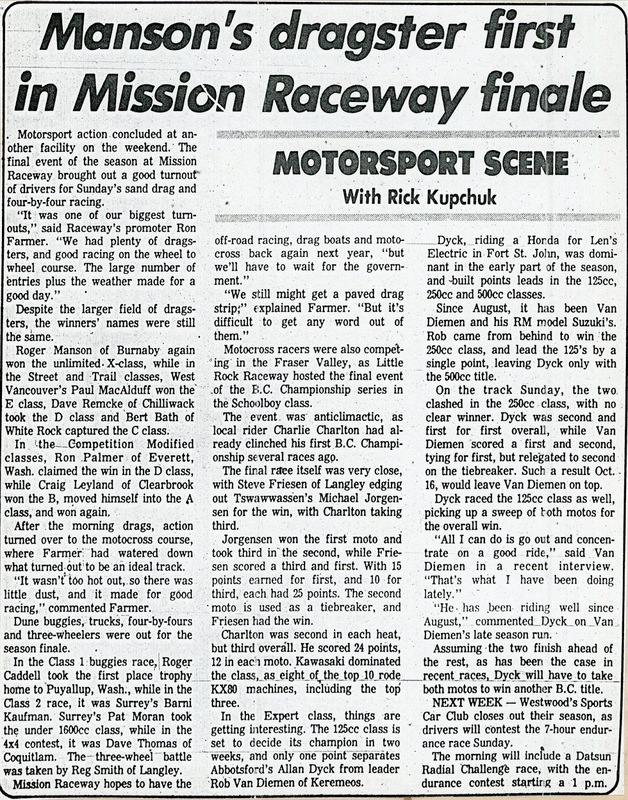 Saturday, May 12, 1979 was rained out. 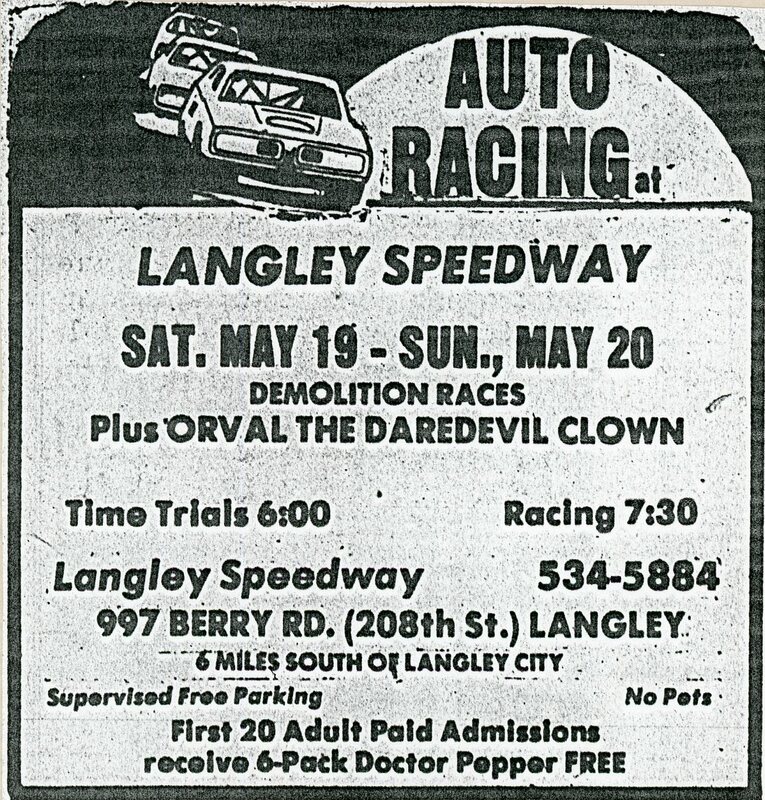 The next weekend was a double header demolition race weekend. 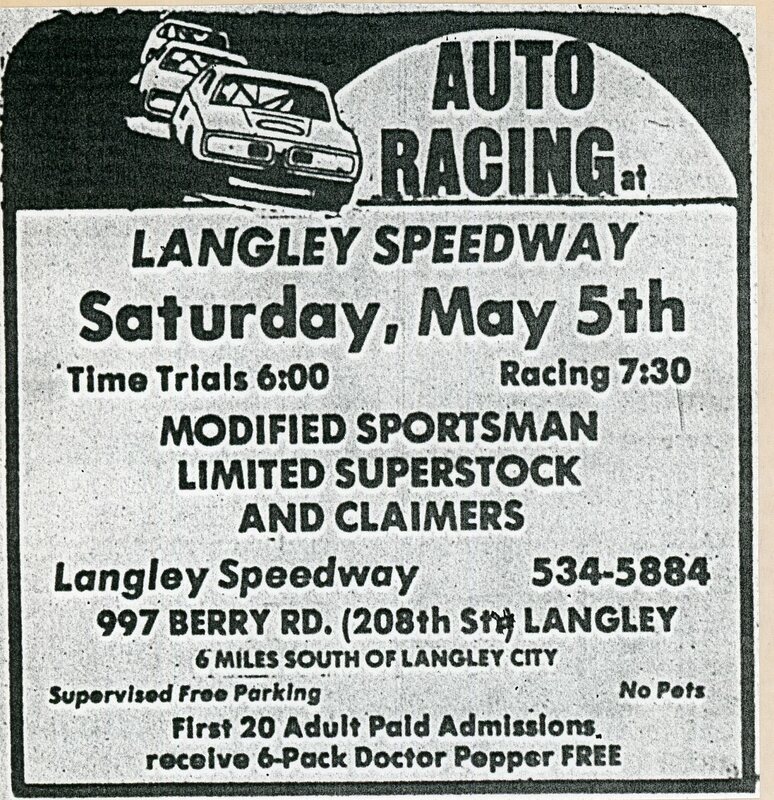 Starting the 1979 season at Langley. 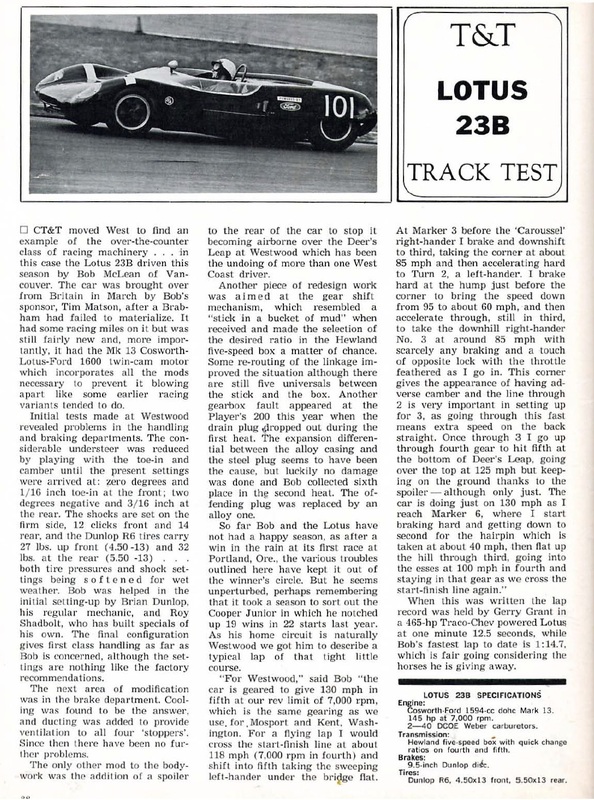 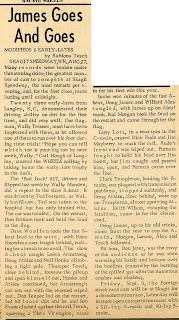 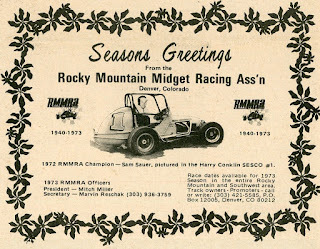 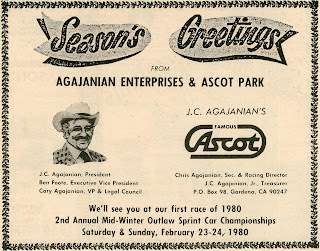 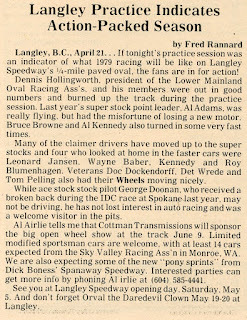 Some pre-season clippings from Racing Wheels by Fred Rannard, Sr. 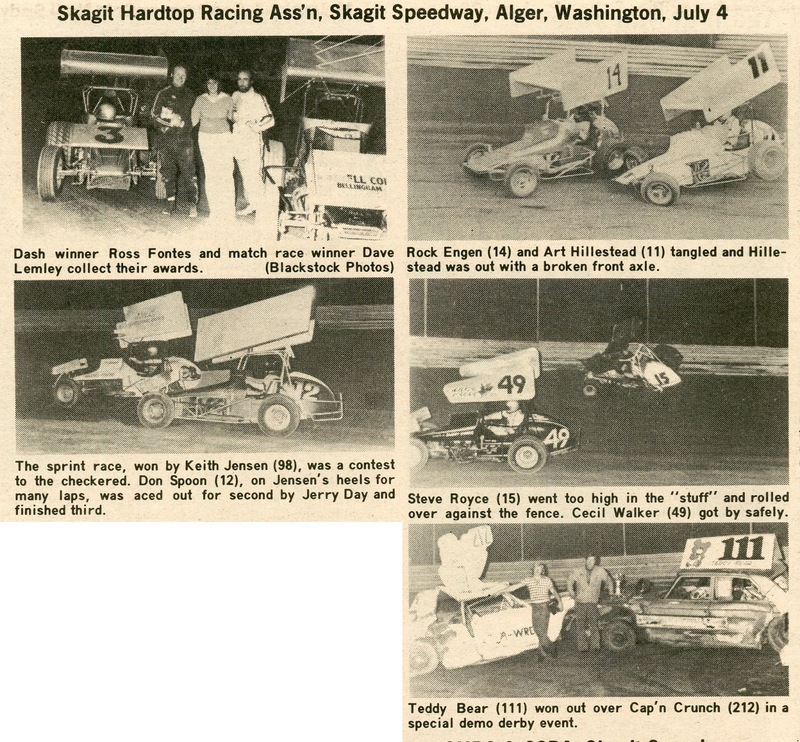 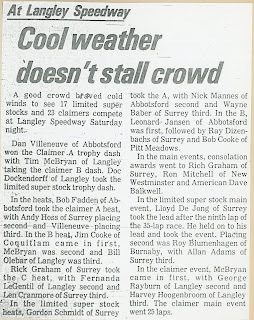 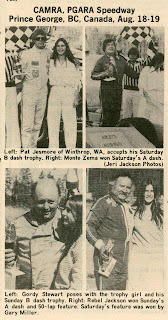 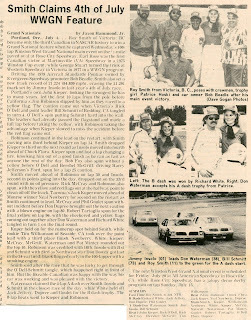 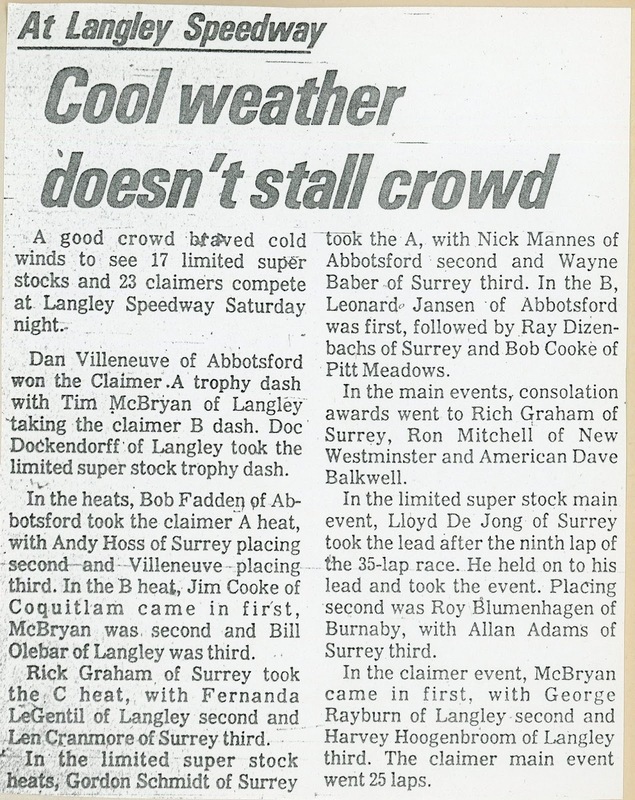 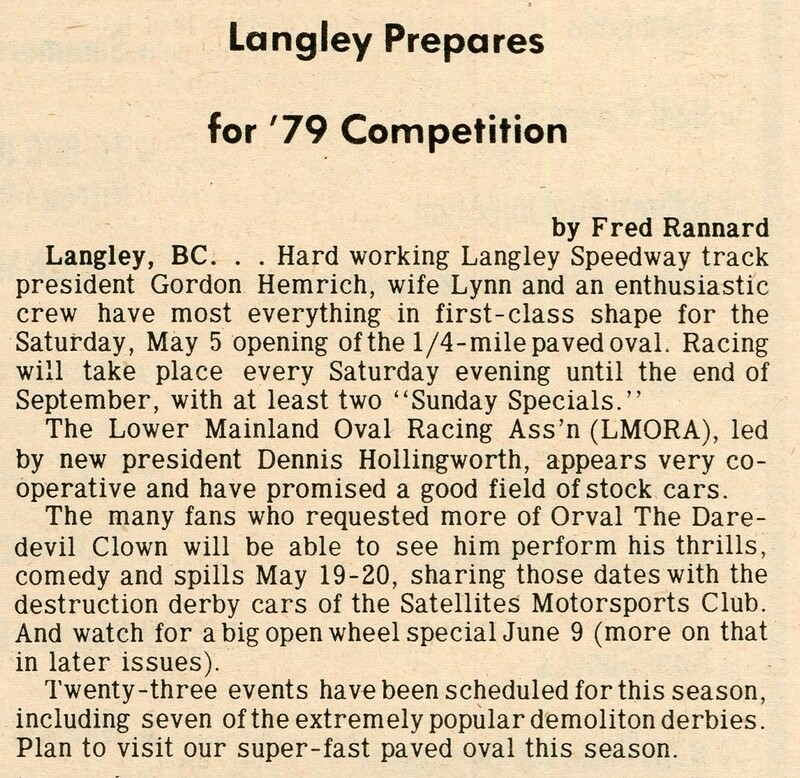 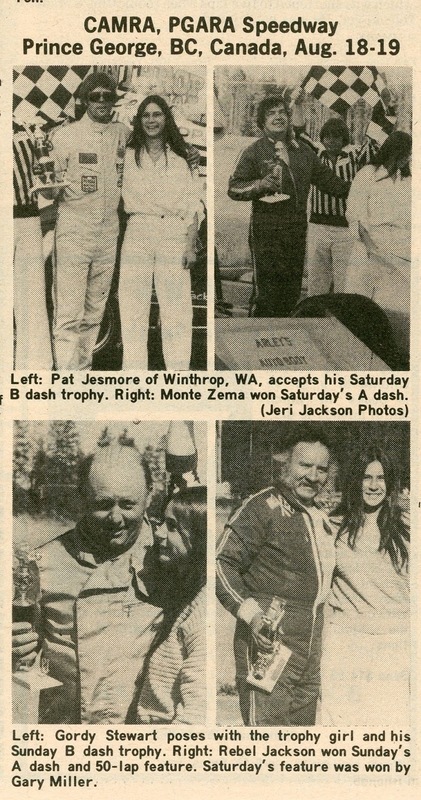 Clippings from the August 29, 1979 issue of Racing Wheels and August 20, 1979 Prince George Citizen newspaper. 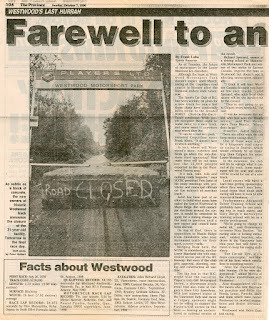 Two pages dedicated to the demise of Westwood. 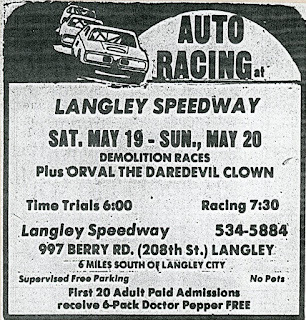 From the Vancouver Province. 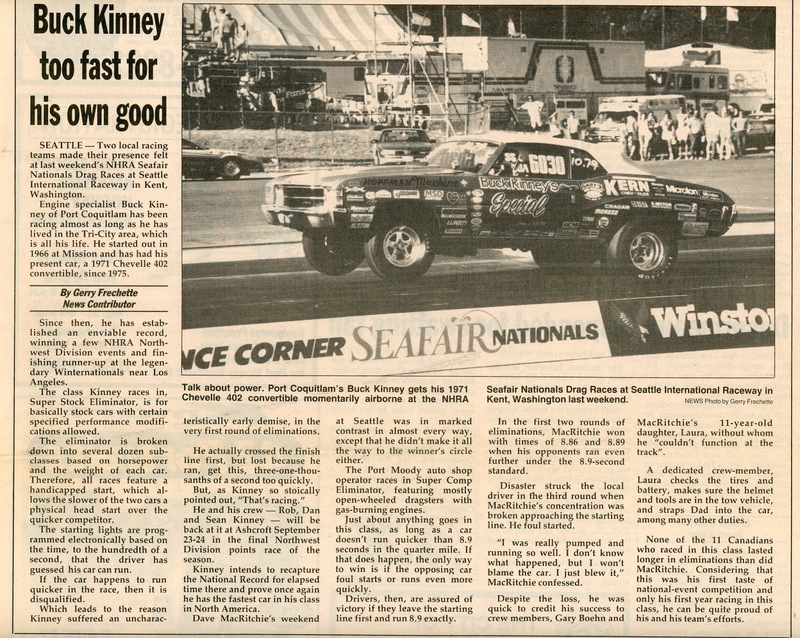 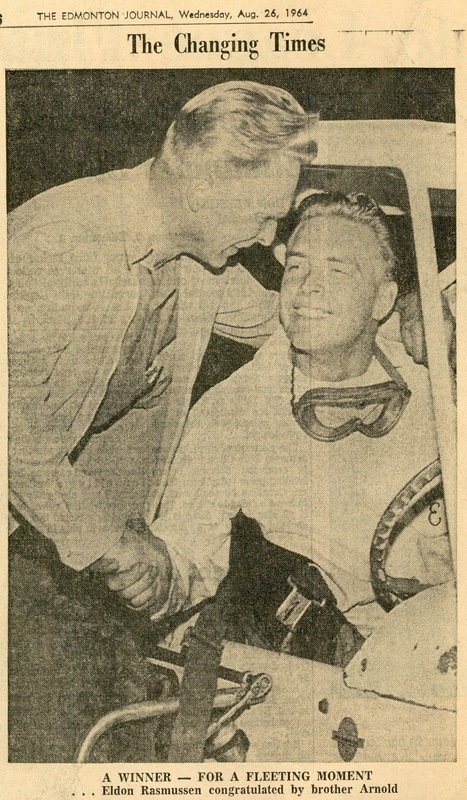 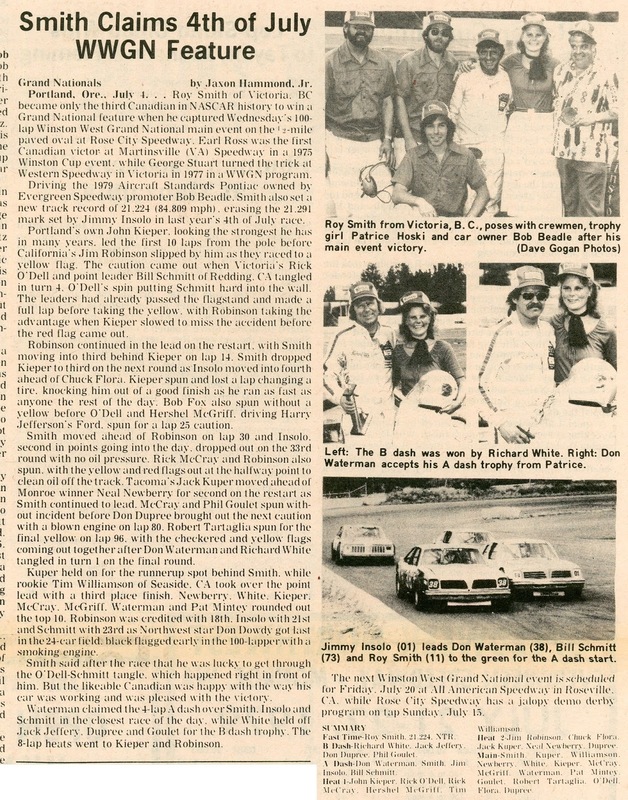 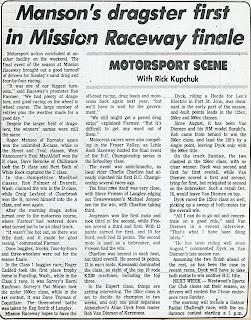 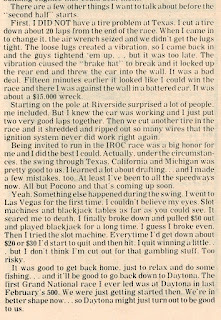 A story on Buck Kinney down at Seattle International Raceway from 1989. 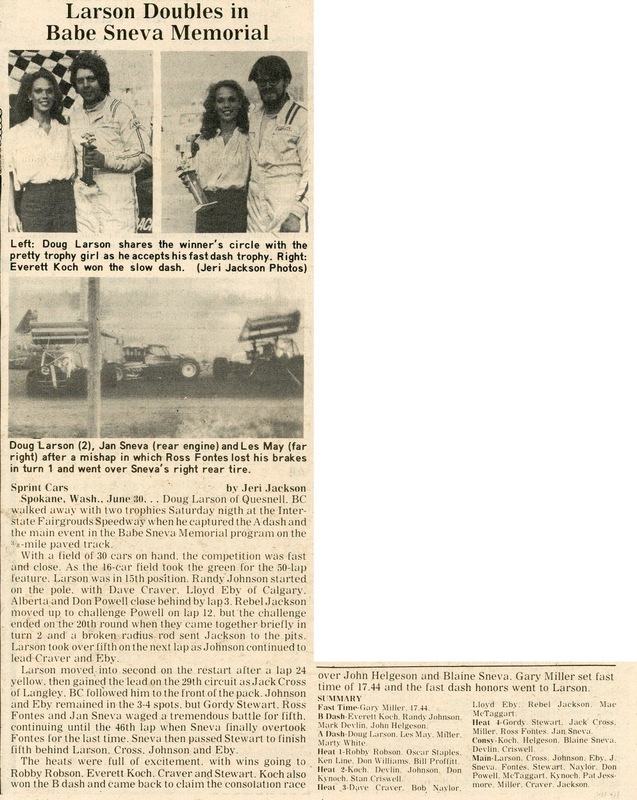 Photo and story by Gerry Frechette. 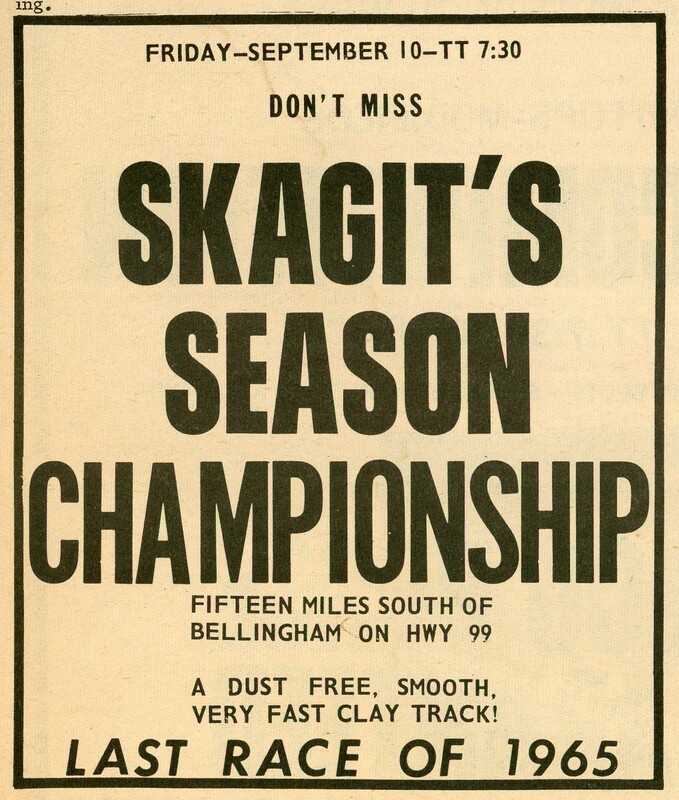 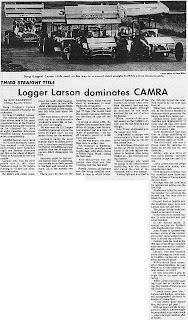 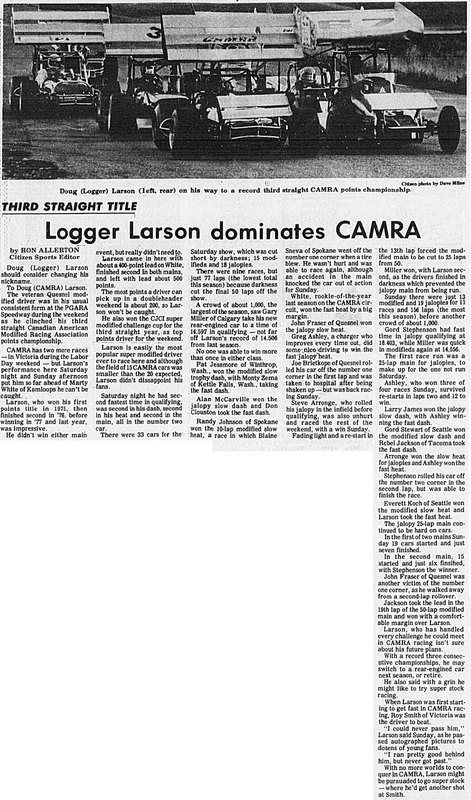 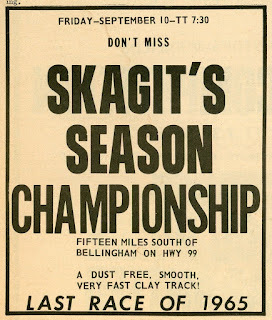 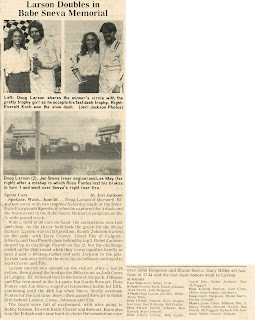 Roger Manson (another Greater Vancouver Motorsport Pioneer, class of 2011) makes headlines in 1983 at the Mission Raceway sand drags. 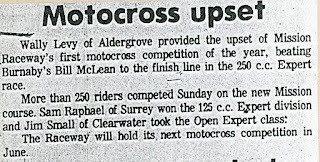 Maurice "Mo" Davidson (a 2016 Greater Vancouver Motorsport Pioneer) sets a record in 1983. 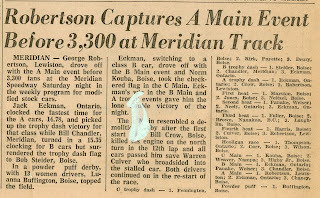 You'll have to follow the link but the video is cool. 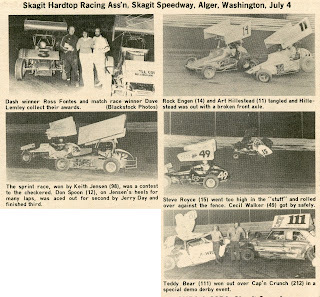 Super modifieds at Evergreen Speedway. 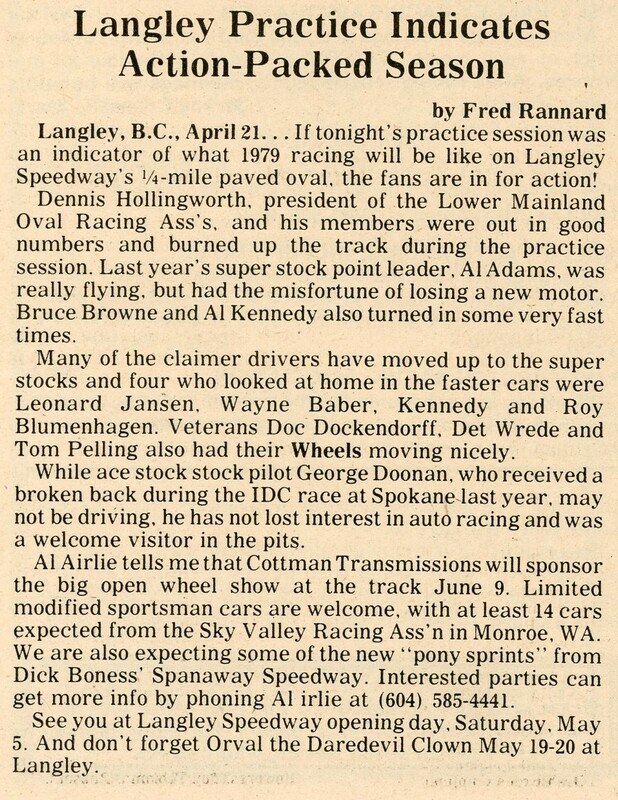 Just to round out this week of 1979 posts. 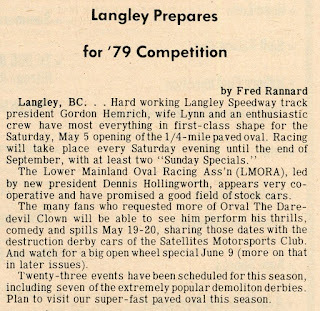 I believe the "Cap'n Crunch" derby car is of Canada's Rick Pemble. 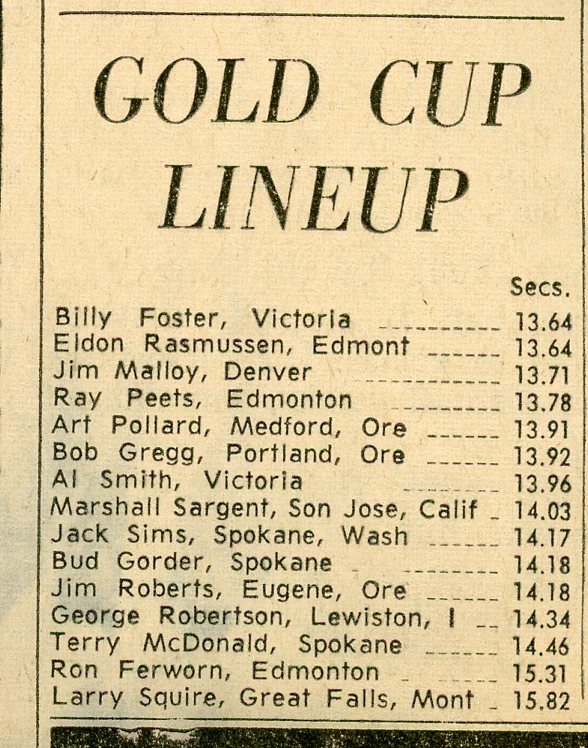 Third Canadian to do so, Roy Smith from Victoria, won at Portland. 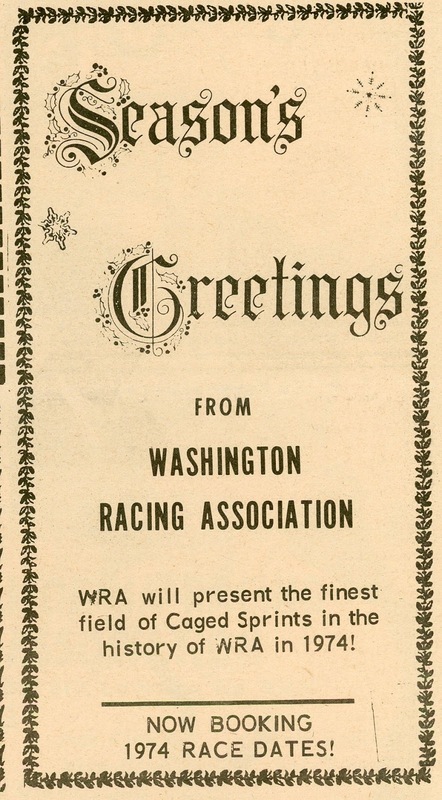 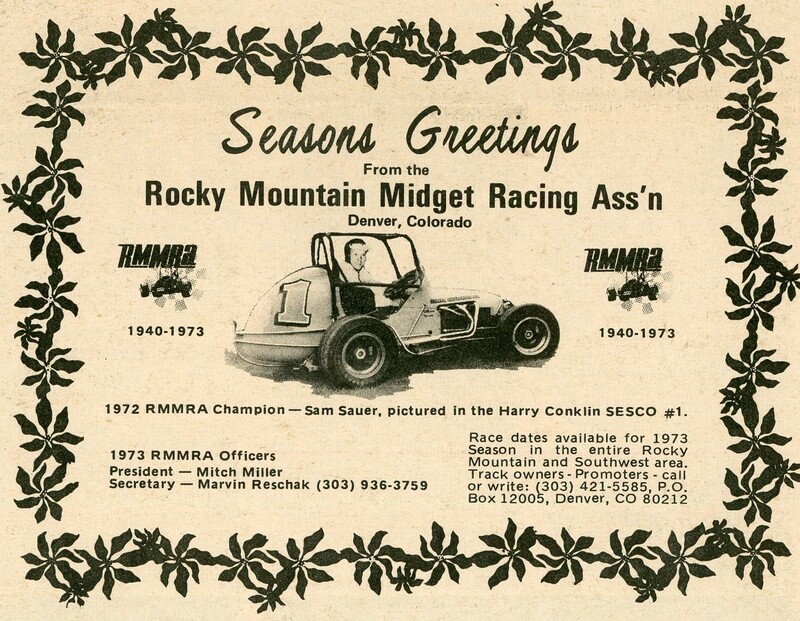 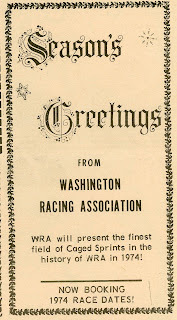 I believe this was a WRA (Washington Racing Association) race. 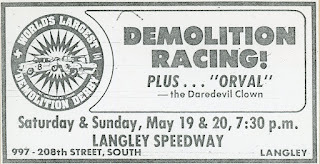 Held at the Interstate Fairgrounds Speedway in Spokane. 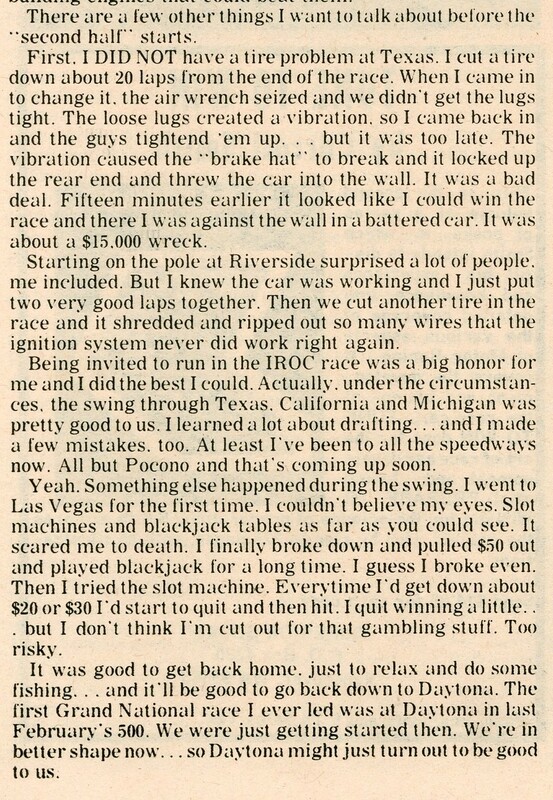 I believe this is post four from Dale Earnhardt during his rookie season. 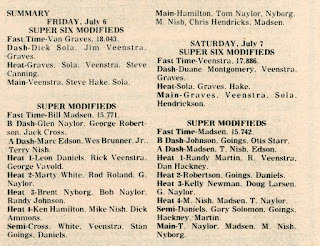 Wild Bill Madsen was the overall point winner for the two day event.